Pressure caramelizing the carrots gives them a silky, luxurious texture enhanced by lemony zaatar mayonnaise. Crisp, bright gremolata and candied nuts give the dish a crunch. Trim the carrot tops so there is 1.5 cm of the greens. Reserve the leaves for the Gremolata. Peel the carrots. Combine the carrots, butter and baking soda and cook in a pressure cooker on high pressure for 15 minutes. Some of the carrots will be darkly caramelized, while some are still bright orange. Fry the carrot top leaves and parsley leaves in canola oil until translucent and crisp, about 15-25 seconds. Drain on paper towel and sprinkle with salt. Gently toss the fried leaves with lemon zest and set aside. Combine all ingredients for the zaatar mayonnaise and place in a squeeze bottle. Refrigerate until ready to use. Heat the sunflower seeds in a small non-stick pan for about 3 minutes over medium-high heat.Stir in the brown sugar, stirring constantly until seeds are coated and brown sugar has melted. Place on wax paper, sprinkle with salt and let cool. 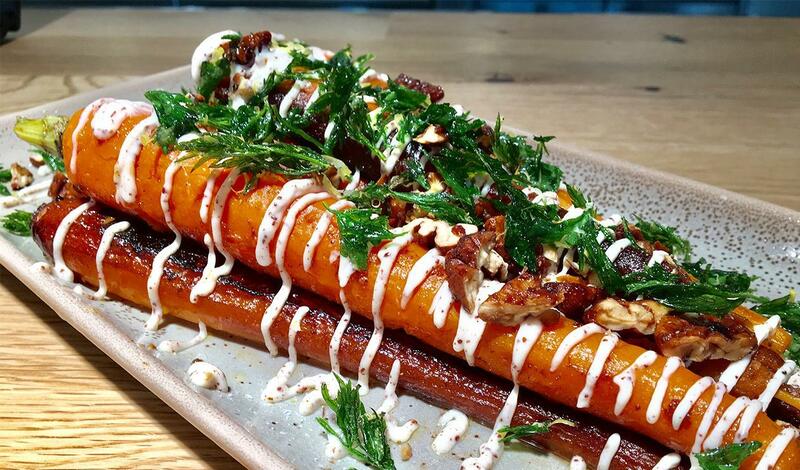 Place the warm carrots on a plate and drizzle with zaatar mayonnaise. Top with candied seeds and gremolata. Serve.